After last weekend’s performance of La Traviata, dell’ arte Opera Ensemble continued its exploration of love and money by mounting Massenet’s similarly themed Manon. The second fully staged opera of a summer festival intriguingly called Violetta & her Sisters, this Manon was more concept-oriented than the ensemble’s production of Traviata. However, it was just as serviceable to the needs of the young artists training in dell’ arte’s program, providing a rich musical text, rife with dramatic challenges. Like Puccini’s Manon Lescaut, Massenet’s opera locates its source material in Abbé Prévost’s moralizing novel, L’histoire du Chevalier des Grieux et de Manon Lescaut, which tracks a complicated affair between a young woman named Manon and a student, the Chevalier des Grieux. 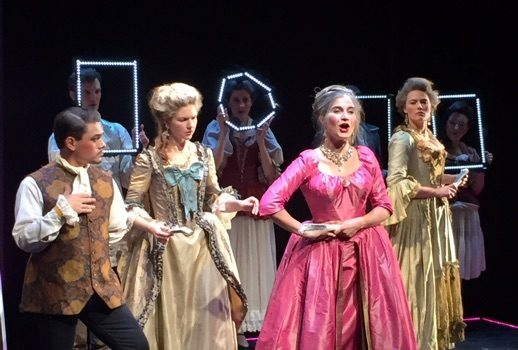 Dell’ arte’s production, directed by Victoria Crutchfield, focused especially on the economic dimensions of this relationship, paying keen attention to Manon’s precarious class status, and its connection to the character’s gender—Manon’s lack of monetary agency as a woman in 18th century Europe. This element was embodied cleverly through clothing, specifically through the use of a mannequin—a multivalent symbol, loaded with sensual and eerie resonances that Crutchfield both metaphorically and explicitly deconstructed. This leitmotif underscored the narrative’s preoccupation with material culture, as well as the unsettling commodification of Manon’s body within the plot. Throughout the evening, the mannequin came to symbolize Manon’s economic aspirations, as well as her nostalgia for the past. During the scene at Saint-Sulpice, Crutchfield even dressed the Mannequin to resemble the Virgin Mary, adroitly blurring the line between the cloistered piety of the church and the worldly sophistication of Parisian society. The image of the mannequin was especially provocative during the ballet in Act III, in which the ensemble disassembled it into separate parts, arranging the body into the positions of a dancer, like a puppet on a string. As such details made clear, Crutchfield’s direction certainly evinced an eye for interesting tableaux; she arranged her singing actors with precision, and she used the small space of the Rose Nagelberg Theater at Baruch College wisely. However, the production’s success ultimately depended on the musicians singing Manon and Des Grieux, and their abilities to be both compelling and believable, despite the narrative’s turbulent turns. As Manon, Olivia Betzen managed the character’s wide emotional spectrum. Fresh-faced at Amiens, and dazzlingly urbane at Cours la Reine, the soprano’s ability to fluctuate between these modes was essential to the evening’s success. Unfortunately, her soprano lacked the charisma of her stage presence, the intonation wavering, and her breath support deserting her near the ends of phrases. As the Chevalier des Grieux, Sean Christensen was the evening’s anchor, sturdy and polished. And while his performance may have missed a clear dramatic trajectory, he was a soothing presence on the stage, due to a professional, confident demeanor. Moreover, his vocal technique served him well, delivering a solid, easy tenor throughout the long evening. As Manon’s cousin, Lescaut, Stan Lacy was pleasantly jocular, and his singing was adequate, if at times forgettable. In contrast, bass-baritone Nick Webb, as Comte des Grieux, possessed a wonderful gravity, delivering an imposing voice with impressive force. Of special note, too, were the members of the French nobility, the effete set who charmed Manon with their refinery and luxury. Andrew Surrena, as Guillot, was dangerously saucy, with a clear, healthy tenor. He moved slyly about the stage, accompanied by three actresses, Pousette, Javotte, and Rosette, sung with finesse by Kristina Malinauskaite, Perri Sussman and Hillary Grobe. And as the nobleman Brétigny, Nobuki Momma added an appropriately oily streak to the proceedings. The small orchestra, led by dell’ arte’s artistic director, Christopher Fecteau, was well adjusted to the size of the small theater, as well as to the needs of the singers. And Fecteau’s conducting was sensitive and brisk, moving the performance along expeditiously. As I wrote in my review of dell’ arte’s La Traviata, the ensemble views itself as a training ground in which young singers cut their teeth on roles in the standard repertory. And again, dell’ arte Opera Ensemble succeeded in its mission of bridging the gap between the conservatory and the professional stage. Such essays into the art of opera are important and noteworthy, on their own terms. And from this angle of vision, the artists involved in dell’ arte’s Manon were relatively successful. I look forward to seeing these singers develop into more nuanced, vocally secure artists. If last night’s performance is any indication, there is much to look forward to.